Worn by crew? Yes. Worn by the crew for their pre-flight portrait and on their post-flight jumpsuits. Flown? Yes. Roughly a quarter of all mission-flown embroidered patches are of this kind. Distribution: Unknown, but apparently very limited. Type: Fully embroidered. Merrowed edge with 'tail'. Scarcity: Very rare. Perhaps 1 to 3 examples sold per year. Value: Unflown examples of this patch have sold in recent years for between $160 and 255. Notes: The Crew Patch and its variant have distinctive square-cornered text. Unlike the variant this version has a distinctly angled engine bell at the rear of the Command & Service Modules. Worn by crew? Yes. 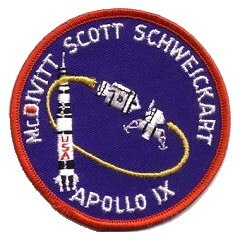 Worn by at least Rusty Schweickart on one of his flight suits after the recovery. Scarcity: Rare. Up to 6 examples sold per year. Value: Unflown examples of this patch have sold in recent years for between $67 and $490. 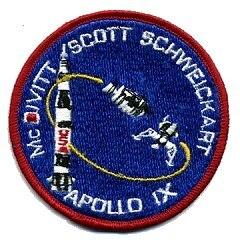 Very similar to the Crew Patch version above but this variant has neater stitching on the spacecraft and a larger engine bell at the rear of the Command & Service Modules that touches the yellow thread behind it. The black detailing on the Saturn V rocket is also neater on this version and the escape tower ends further away from the "S" of "SCOTT". These details can be seen in this photo on the flight suit of Rusty Schweickart on the recovery ship U.S.S. Guadalcanal. Flown? Yes. Roughly half of all mission-flown embroidered patches are of this kind. Type: Partially embroidered on blue twill. Merrowed edge with 'tail'. Scarcity: Very rare. Perhaps 2 to 3 examples sold per year. Value: Unflown examples of this patch have sold in recent years for between $90 and 400. 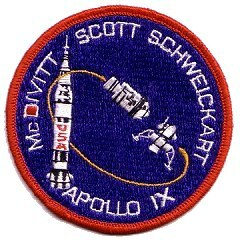 Notes: Apart from the different font and the twill background, the easiest way to tell this from the crew version is that the escape tower on the Saturn V points to the "S" of Scott in this version.